One of the reasons why many people prefer Android to other operating systems is its amazing capability of customization. If you have root privilege on our device, you can customize it in a way you want. It’s almost impossible to make the most of an Android device without rooting it. At DroidViews, we focus on making Android users aware about how they can root their device and modify it using custom ROMs, mods, and hacks. If you own the Galaxy Tab A, you should root it to take advantage of custom ROMs, root apps, and mods. Today we’ll see how we can Root Samsung Galaxy Tab A SM-T280 and install TWRP recovery on it. Just follow our step-by-step tutorial. We’ve taken all care in writing this root guide and keeping it detailed and clear. Please follow the procedure described below carefully or you might end up with a device stuck in a boot loop. Though you can restore your Tab by installing the stock firmware, it’s still better not to get into complications. Read the guide and make all preparations before proceeding. Enable USB Debugging and OEM unlock on your Tab from Settings> Developer options (see how to activate Developer options). Backup all apps and data present on the internal storage of your device. Turn off your Galaxy Tab A and boot it into the Download mode by pressing and holding the Volume Down + Home + Power buttons simultaneously for 2-3 seconds. When you see the warning screen, press the Volume Up key. Open the Odin folder and launch the .exe file as administrator. Now connect your device to computer using a USB cable. When your Tab is detected by Odin, the ID:COM port will turn blue. Now click the ‘Options’ tab on Odin and uncheck the ‘Auto Reboot’ option. Click the AP button in Odin and add the twrp_3.0.2-1_sm-t280_261016.tar file to it. Now click the Start button to install it. When the recovery file is installed, you will get secure check failed error. Don’t worry about it. Just press and hold Volume down + Home + Power keys together. As soon as the screen goes blank, change to Volume up while keeping the Home + Power keys pressed. Tour tab will boot into the TWRP mode. Tap the Install button in TWRP menu, locate and select SR1-SuperSU-v2.78-SR1-20160915123031.zip and install it. After flashing the SuperSU file go back to the main menu in TWRP, tap Install and flash boot.img as “Boot”. When the file is installed, select the Reboot> System option. When your Samsung Galaxy Tab A SM-T280 boots up, it will have root privilege with TWRP Recovery installed on it. Done! To verify that your Tab A has been properly rooted, you can install and run a free app called ‘Root Check’ from the Play Store. Hi Rakesh, I’m having problems with the step 10. 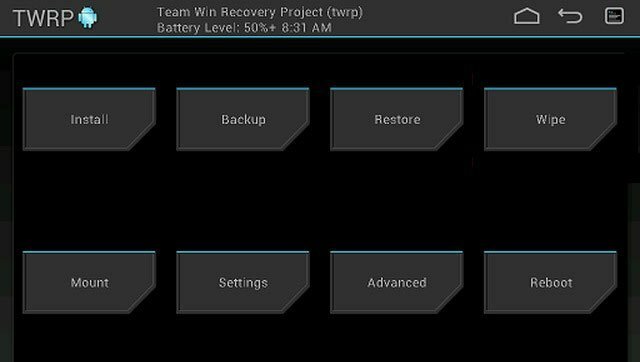 Can’t find boot.img in TWRP Recovery. Is it safe to continue without this? Copy this file to your Tab. You can do this by connecting your device to PC while booted in TWRP. If you don’t find the .img file after copying it, use the Reboot> Recovery option. When TWRP reboots, navigate to the location where you copied this file and flash it as directed. Does this work for the Nook version of the A6? I was given it as a gift and it’s super bloated, i.e. not very useful. I don’t want to brick it by trying the above process, however, if it will fail. Hi, can you please mention the model number of your Tab? Odin will not work with a ***.tar. It has to be a ***.tar.md5. Where is that file? Odin can flash files without .md5 extension. Anyway, if you are having problem, just add .md5 manually after the file name, so that it is named as ‘twrp_3.0.2-1_sm-t280_261016.tar.md5’. thanks, but I did that and got some binary error in response. I went back and checked and found out that twrp_3.2.1-1_sm-t280_080118 was downloaded from your link, is that ok or do I need the ***1016 file? Thanks. I retried and got md5 error – binary is invalid. I extracted the recovery file into recovery.tar.md5 and that appeared to work. But doing step 8 only gives a normal boot with no twrp and no root. Using the hardware key combination to boot into the recovery mode a bit tricky. You must try a couple of more times and follow the stepsc] carefully. All I know is, it works because I rooted my tab long ago using the same files and steps. The TWRP loaded properly but when it tried to restart after flashing the supersu the tablet got stuck on the boot screen. Won’t turn off. Hi Yuvraj, what Android version your Tab A has? You should flash the stock firmware to fix your tab first. You can then attempt to root it again using a different method. Let me know of you want any assistance with that. worked for me — all the links and all the steps — everything worked. Glad to know it did! Keep visiting DroidViews for more updates and tips for Android. Perfect… ezpz with your tutorial!! thank you!! this worked perfectly for me my guy, are you sure you did everything right, i used a samsung galaxy tab a6 SM-t280 and flashed with root perfectly. Glad to know it worked for you guys. I rechecked all steps after reading Todd Groove’s comment. Please make sure you follow the directions carefully as this is a easily brickable device! Go to your downloads folder and find the supersu_2.78_SR1_systemless_boot_t280.tar file. RIGHT-CLICK on it and in the context menu you’ll find the usual things (Open, Cut, Copy, Paste, etc etc) but look for ‘7-Zip’ and hover your mouse pointer on that. Another context menu opens. Click on ‘Open Archive’ and voila! All you need to do now is copy the boot.img file onto your device, Give it a few moments, press ‘Install Image’ on the tablet, boot.img should now show up, select it, select the ‘boot’ option on the next step. Hey presto. Thanks for sharing your experience and the details! The method to get “boot.img” is already given above. Thanks and I owe you a beer. Hi Rakesh, after completing step 9, 10 and when I click Reboot>System, it still brings me to the TWRP software rather than starting the device normally. Can someone please help me start the device? Hi, were you able to fix the issue? Sorry for late reply. could not do normal boot. invalid id KERNEL LENGH! @DroidViews:disqus Hi it wont let me download the supersu_2.78_SR1_systemless_boot_t280.tar file it keeps telling me “no mirror link available” what else can i do. @Rakesh Hi it wont let me download the supersu_2.78_SR1_systemless_boot_t280.tar file it keeps telling me “no mirror link available” what else can i do. @DroidViews:disqus Great tutorial. Rooting worked perfectly. I was able to remove all bloatware from my brothers tablet. It worked on the first try but I really panicked wehn i did not find the boot.img file on the tablet and that is where the tutorial lacks Instructions. You did not tell how to exactly to install the boot.img file using the ‘install image’ button in the TWRP menu and so I did not realise how to do it at first. Many people will be confused at this step because they expect the boot.img file to be shown instantly, but in this case one can only find it after pressing the ‘install image’ button. I cannot find the boot.img file on my tablet. I tried following the directions precisely as I understand them and my tablet doesn’t do anything anymore. I’ve tried copying the file to an SD card then installing it from the SD card, but it doesn’t appear on there, either. I can see it when I check the card on my phone and on my computer, but not from the tablet. When I try to open it on my computer (because I’m an idiot), it says that the file is corrupted. I’ve tried to find it elsewhere online and failed. I’m sure that I’m missing something obvious, but I can’t figure it out. Help? Ok, I can find it through twrp’s file manager, but I can’t figure out how to flash it. Never mind. William’s advice above did the trick. I still can’t confirm if it worked due to work wifi, but I use the tablet again, so that’s a great start. Hi Rakesh, Thanks – the instructions are perfectly clear. I rooted my tablet to get rid of bloatware like Kids Mode, SPlanner etc. Root App Deleter somehow isn’t able to delete them? After 2 factory resets, one trip to the local hand phone repair geek….to “unbrick” it, I started the process Tuesday morning 08 10 hrs, at 08 15 hrs it was done. BRILLIANT!!! I,m over the moon! On another note, Is this Firmware file 1.0 GB???!!! Hi, Rakesh. Thank you for putting together these instructions. I can’t seem to get past the “Downloading…Do not turn off target” screen. No one else seems to have gotten stuck at this point. Can you point to where I need to go from here? Many thanks in advance. Ummm . . . yeah, me too? What am I doing wrong?? Hello one and all, I have put my mind on doing this ROOT, but need some advice seeing as I,m by no means an IT geek. Bullet 1. 2. OK. Bullet 3. Do I need to unzip this and only copy the DISC image.or the whole file ? Bullet 4. Downloaded and Unzipped. Bullet 5. Once again do I need to unzip and only copy the Disc image or the whole file ? To do this copying can I connect to PC and just drag and drop files to TAB device Storage?? Finally, do I need a good internet connection to start the process?? If so I might as well take it to Singapore next trip, because here in Indonesia the WIFI, at least, where I am is chaotic at best. Rakesh – can you please please please help me, ive followed the steps and ive done and got right to the end, but it says after flasing the Supersu, go back and install flash boot, but i cannot find that anywhere, so i went ahead and rebooted it and now my Samung Tab A6 T280 is stuck on the Samsung logo and i cannot get into my Tablet at all, i tried to get the filmware but i dont know my model etc as i cant get into the tablet. can you please help me with this Rakesh? Hi Mike, where are you from? Hi Rakesh, I done it, thanks mate, I got it back up and running. This tutorial will work flawlessly. Extract ‘supersu_2.78_SR1_systemless_boot_t280.tar’ to get the ‘boot.img’ and install it in TWRP as boot when you are prompted to do so. Let me know. It should work. Hi Rakesh, can you help me get my T280 back on? hi, i did mine but when i got to the final stage and it said to go back and boot, i could’t find it so i went and rebooted it, and now my samsung tab a SM-T280 wont turn back, please help me someone? Not working for me, I just get frozen on the samsung galaxy tab a6 screen when i try to get to recovery mode. Any ideas? I already installed the original firmware and did the process again with the same result. what do you do if twrp boots with a message about the unmodified system partition? Quick Q: when I download and extract TWRP to the folder I’m going to Odin it to the tab from, I do not get an md5 file of any sort. I get a recovery.img file instead. What am I doing wrong? You don’t need to extract the TWRP.tar file. Just add it to the AP section on Odin and install it. Thanks for the appreciation, Filippo! I have tested it personally. It works. Try flashing the SuperSU zip again. Hey I need to install Snapchat but theres a problem with using it on rooted phones.How do i unroot this tab to sign into snapchat and then reroot? yeah i just need to unroot it first and its not as straight forward on my tab. why can I not find the image anywhere to install it ???? I have done it all correctly and now both kids tablets are stuck on the Samsung galxy tab a android screen and will not do anything ! are they garbage now ??? Hi, after which step did your Tab get stuck on the Samsung logo. No, you devices are not garbage, you can restore them by installing the stock firmware. Between, what do you mean by “I not find the image anywhere to install it”? main menu in TWRP, tap Install and flash boot.img as “Boot” this is where the image could not be found. Upon a reboot the tablet remained on the black Samsung tab A screen .. I will try the firmware today thank you fingers crossed . You have to download all files mentioned in the tutorial. In that case you can go ahead and root your tab. Oh and also if I have a galaxy tab A that is made from Samsung w/ the lollipop thing what should I download when I am making preperations? Please mention the model number of your Tab. You can find it under Settings> About device. If I do this what is the most draining and/or unimportant app that I should uninstallook? Install the SuperSU Zip file in TWRP again. Let me know about the result. OMG! FOR EVERYONE WHO CANT FIND THE BOOT IMG. AFTER INSTALLING SR1-SuperSU-v2.78-SR1-20160915123031.zip……. JUST GO BACK TO TWRP THEN CLICK INSTALL.. GO TO TH FOLDER WHERE YOU PUT THEE BOOT IMG,, IF YOU CANT SEE IT.. JST CLICK AND CLICK INTALL.. AND BOOTIMG WILL APPEAR!! YOURE WELCOME!!! AND THANKS RAKESH! Glad to know it worked for you! Enjoy! did you manage to get it back on? because mine has done the exact same thing, i need help, i cant get my tablet to turn back on, what do i do? When I execute steps 6 and 7 Click the AP button in Odin and add the twrp_3.0.2-1_sm-t280_261016.tar file to it. Now click the Start button to install it. I get an error- Blocked by FRP lock on the device. How do I get past that? my tablet just performed an update yesterday. Is there possibly any problem with this root procedure that might be incompatible? Also, I’m from Canada and bought it here. Could that be a problem? If your Tab’s model is SM-T280, the root method should work for you. Mine says “Custom Binary(RECOVERY) Blocked By FRP lock” How do I remover that? i can’t find “boot.img” and the boot folder has nothing in it, even though i copied boot to the tablet. you need to press “select boot image” button (its something like that) when in twrp. Hi, and thank you. My issue is I cannot get past Step 7. I click start and nothing happens. I also noticed that the .tar file is much smaller than the one in your example, and also does not have the same MD5 extension. I have redownloaded the .tar file a few times, always the same results. Any suggestions, and thanks again…? AFAIK, I followed the steps exactly. Yet, Root Check tells me that my device is NOT rooted. What did I do wrong? Or, is there an updated file I needed? It says I’m running Android 5.1.1 (Lolipop) — is this walkthrough not compatible with my device and/or OS version? Please help! Exactly the same issue for me. I hope you get an answer. My devices exactly same as yours — SM-T280 5.1.1 — and everything seems to have gone smoothly, except Root Check says NOT rooted. Hi, I am going to update the tutorial. Hi Grey, the guide has been updated with new files, please try it again and let me know. I should work now. YES YES YES YES! You are the awesome dude of the day, my hero. Thank you so very much. I hope that Nathan above sees this because the file change worked. I’m so happy right now. I have 30 of these things that I need to root so they can be used by my 7th graders to learn App Inventor. You just made my life so much easier. Thanks for the appreciation, Grey! Chrome and/or Windows Defender says there’s a virus in the twrp & seamless boot files and seems to be removing the files right away. Should I ignore and find a way around this, or are these legitimate detections? Hi Nathan, I just updated the tutorial. Try it again from the beginning. Chrome and/or Windows Defender says there’s a virus in the twrp & seamless boot files and seems to be removing the files right away. Should I ignore and find a way around this, or are these legitimate detections? Maybe it’s detecting something root-ish/hack-ish, but not an actual security risk? Nevermind. I went ahead and did it anyway and IT WORKED! Thank you so much!!! I have just one more tablet to root, then I’m on a quest to disable that darned “guest” account. Thanks again, Rakesh! Glad to know I was able to help, Nathan! hi Nathan, i need to disable “guest account ” too, was it easy to rrot and how disable “guest account” ? Re-download the zip file. It might be corrupted for some reason. Since I rooted my tab using the same files, I am sure they work flawlessly. I downloaded the file from the two sites (main and mirror) and still have the same problem. Here is a screenshot of the message that is showing me. i surf the web and found a new SuperSU file (SR1), which worked for me. it bypass successfully the zip signature verification. I already updated the guide with the same SuperSU version and was going to suggest you. LOL! So I did everything but i don’t boot into twrp how so?? Nevermind I found out thank you Rakesh! You forgot to mention, if you deactivate Developer Options, your tablet will not boot anymore.!!!! You have to connect to pc using Samsung Kies. After root , your tablet will drain battery twice faster! Tested on Samsung Galaxy tab A T280, brand new.So , I don`t recomand rooting your tablet.I see nothing good for a normal user. Once rooted, you can deactivate USB debugging if you want to. As for the advantages of having root privilege, you can find a number of root apps, Xposed Framework and even some custom ROMs for your tab. So just to be clear, I can deactivate Developer Options? And if I leave the same rom, is there reason that the tablet will drain Faster when rooted if no further changes are made? Toshiba satellite has me concerned and all I want to do is root to remove bloat ware. Rooting does not affect battery usage. It simply gives you access to hidden system files and modify them. As for the bloat apps, you can delete them easily using a root explorer. We already have some guides here to help you with that. Hey for some reason i can not access the oem settings or the developer options, may you please help. thank you. Hi, please ignore that if you don’t find the option. Just enable “USB Debugging” and proceed. How do I enable that option? I’m having the same problem. I turned off the OEM lock and now my tablet wont boot. It works ! Can I deactivate Developer Options after all is done? You might get that warning but the file doesn’t have any trojan. It works! Thanks a lot!! I just checked and I have root privileges. You guys are awesome! Great timing since I just got this tablet today and immediately went looking for a root method and you guys delivered. I really appreciate it. Thanks again! Glad to know it worked perfectly, Nathan!